Finnish Elections: Jussi Halla-aho’s methodical strategy in taking The Finns’ message to the people pays off…….. – The Tundra Tabloids……. Believing that the Finns Party under the guidance of party chairman, Timo Soini, who had led the party for 20 years would be tightening immigration controls and taking a more no-nonsense approach to EU bailouts and the EU in general, they were badly mistaken. The party’s popularity soon began to take a nose dive in the wake of the massive numbers of illegal aliens crossing Finland’s border on its northern border with Sweden, after its leaders began parroting the government’s party line. It was just all too much for the average supporter to take. In 2017 in Jyväskylä, at the party conference to elect new leaders, the Finns shocked the country in electing Jussi Halla-aho to lead the party. A host of close Halla-aho supporters snapped up other leadership positions thereby sealing off the “old guard” from party decision making entirely. It was too much for Soini to take. From one moment handshaking in front of the media to the next day crowing about how a “coup” had taken place. It’s called democracy, and remaining party members recognized that. The bitter clingers did not, they revolted, things did not pan out as they should have (read = did not like the democratic results). What followed played into the hands of the newly minted party leadership, with the newly disenfranchised opting to form a new party in place of staying put, and waiting till next time. It was a God-send. 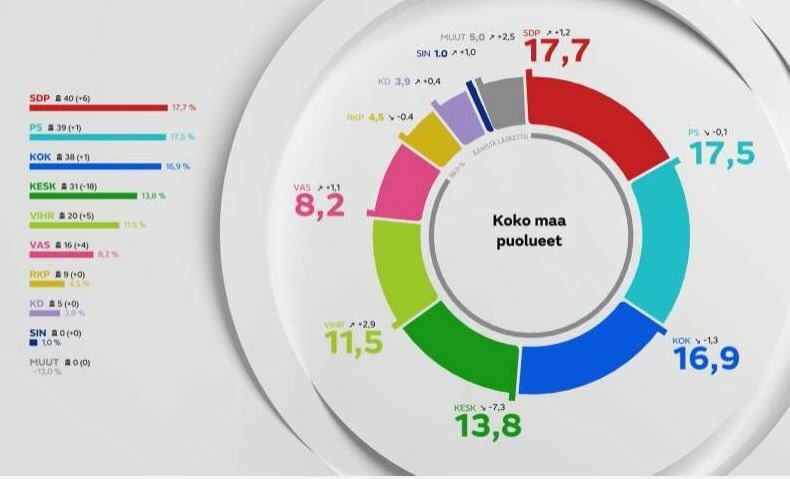 Freed from the self-jettisoned dead weight, Jussi Halla-aho and crew charted a new political course to win back the 19 seats it lost when Soini and the rest of his MP-ilk left to form a new party called the “Blue Alternative” (Sininen tulevaisuus). Their ministers stayed in government, but the Blue Alternative itself was on life support the very moment it became a party, with barely a pulse registering in every poll taken since then. Coming into the latest elections, the Finns Party embarked upon a strategy that basically honed in on their core message of previous years. Immigration, threats from Islamic terrorism, globalization vis-a-vis the working class, foreign aid expenditures, infrastructure, healthcare, the economy etc., were all mentioned. What was new was the “climate change” debate. The Finns leadership (correctly) cast their opposition as fear mongers, who were depicted as using hyperbolic language meant to scare voters into their respective camps. Halla-aho, in one election debate after the other, kept hammering the party’s points home, and it registered. The rest is history. Now what remains for the newly defeated (yes, in spite of their razor slim majority, I include the SDP as well) is to coalesce a new coalition government. It’s going to be extremely difficult negotiations. No single party of the top four have a clear cut majority. The Finns Party, in spite of resting in 2nd place, actually has a driver seat position, even if the other parties are not willing to admit it, openly. Behind closed doors in the boardroom, however, reality will be different. The time of the “Big Three” parties in Finnish politics is over, this is the second time a winning party came under 20%, last time around it was in 2015 when the Finns Party won basically the same amount in seats. The SDP chaired by “low-energy” Rinne wants a complete reversal in policies from the last government headed by Center Party and its coalition pal the National Coalition. The SDP wants an increase in taxes to pay for its “climate change” policies that the Greens Party believes are not tough enough. Those two parties (NC and Center) will reject that. Also noteworthy is the fact that the SDP headed by Antti Rinne is facing deep criticism in his own party, they were not to have won by such a paltry number. They’re greatly disappointed that they didn’t get the mandate that they thought they would. There is talk in the media that he might be challenged for control of the party. Who knows, he might be right, but I can’t really recall a time that I ever agreed with any of his analysis on any given subject. What is more likely a scenario, according to a political analyst at the Ilta Sanomat, is the formation of an opposition-led government comprised of the last government. 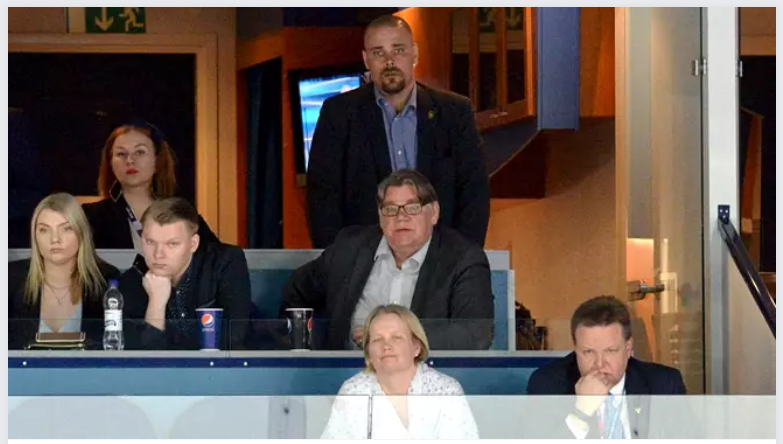 This time, however, the Finns Party is led by Jussi Halla-aho and not the guy watching women’s hockey on election night. Next Post Next Post US: NYC Mufti says Muslims should hate non-Muslims, no integration for us……!